You are cordially invited to browse the gallery of works by the artist, Marian J Meakin. 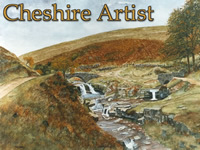 A wide range of prints are available of local landscapes, pets, animals, wildlife, house portraits, churches and canals, inluding one of Three Shires Head, Algreave, shown to the right. 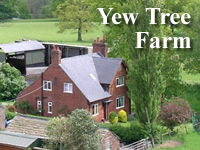 Yew Tree Farm is an ideal base for a relaxing holiday in the heart of the Cheshire countryside as well as a central location for those on business seeking a restful stay within easy reach of the Potteries and Greater Manchester. Situated in the tranquil hamlet of North Rode near Congleton, Yew Tree Farm is within sight of the Peak District and Staffordshire Moorlands. 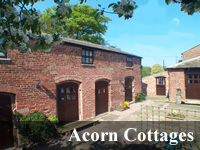 Two holiday cottages converted from farm buildings located on small working farm on the edge of the Peak District and Cheshire plain. Between the towns of Buxton, Macclesfield, Leek and Congleton. Stay for a week or a month, come for a holiday, relax, visit friends, family and the area which has many National Trust properties, great scenery and attractions.